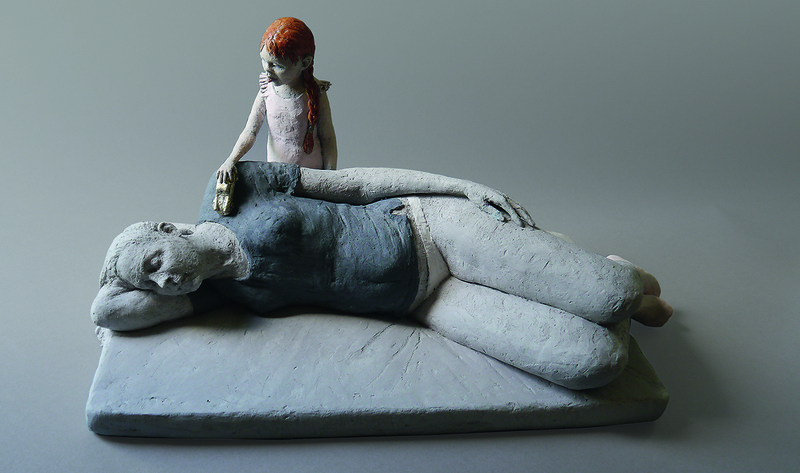 In the PROFILES section: Eight ceramic artists from Spain, Germany, USA, Romania, South Africa, Italy. Coverage of EXHIBITIONS and EVENTS in Switzerland, Germany, UK, France, Netherland, China. In the section ARTIST JOURNAL, we present Yuan-Te Wang and Bean Finneran. And we also have interviews with artists IN STUDIO as well as listings of Dates, Courses, Seminars and Markets. The uninhabited lands of Teruel are like a gigantic geological laboratory, the strata of different types of rocks and clays form a kind of natural “neriage”, the deposits of fossils bring the memory of the seabed and the fossilized footprints of dinosaurs impel the imagination towards disappeared worlds. In this environment, Lourdes Riera, also known as “Caelles”, was trained as an artist. 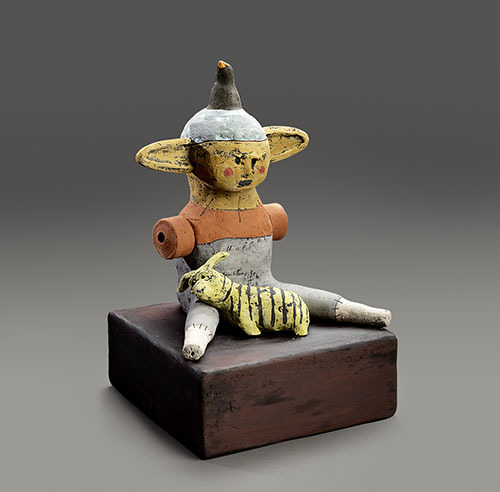 Riera left her native Lérida when she was very young to settle in Teruel; there she studied ceramics at the School of Art and at that place she began to exhibit in 1989. 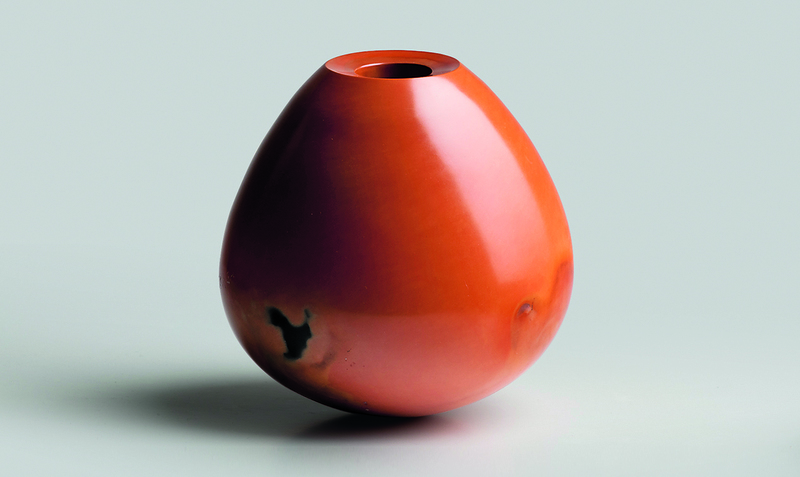 Since then, he has displayed in more than thirty exhibitions, of which the latest, and probably the most important, has been at the School of Ceramics in Muel, near Zaragoza, where she presented dozens of pieces that perfectly define her career. 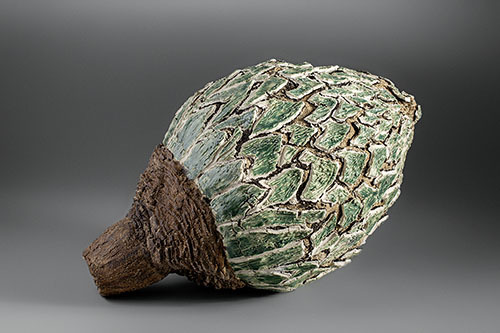 The vessels and vessel sculptures of Eva Koj have been fascinating visitors to markets and galleries for over a quarter of a century now with their frequently contradictory appearance on the one hand and their flawlessly thrown forms on the other. She makes both unique objects and tableware for everyday use. Eva Koj has mastered both roles. Sometimes, Goethe comes to mind: two souls exist in her breast. And she pursues them both with the same degree of craftsmanship and artistic conviction. Eva Koj was born in Ratingen, North Rhine-Westphalia, in 1962. After work experience with Christine Atmer de Reig from 1983 – 85, she studied fine art / ceramics at the technical college of design, now the Muthesius University of Fine Arts and Design, under Professor Johannes Gebhardt. Her studies were complemented by a study trip to South Korea and a study visit to a glass blowing workshop in Sunderland, UK. She graduated in 1992 and took over the Stadttöpferei, the municipal pottery in Neumünster until 1995. This was combined with running the Galerie im Fürstenhof. 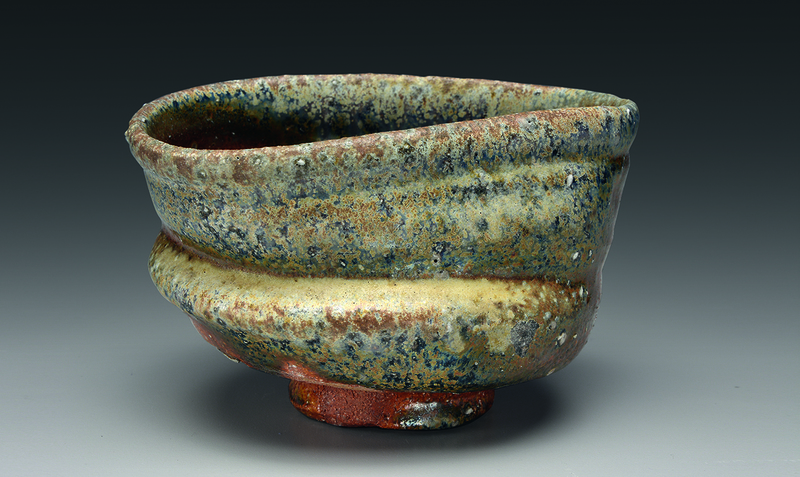 My name is Andile Schoellhorn and I am ceramicist currently based in Germany. My introduction to ceramics began in 2006 when I started studying Ceramic Design at the University of Johannesburg in South Africa. After completing my studies with a National Diploma I interned in a ceramic gallery and soon after moved to working with a product design company. 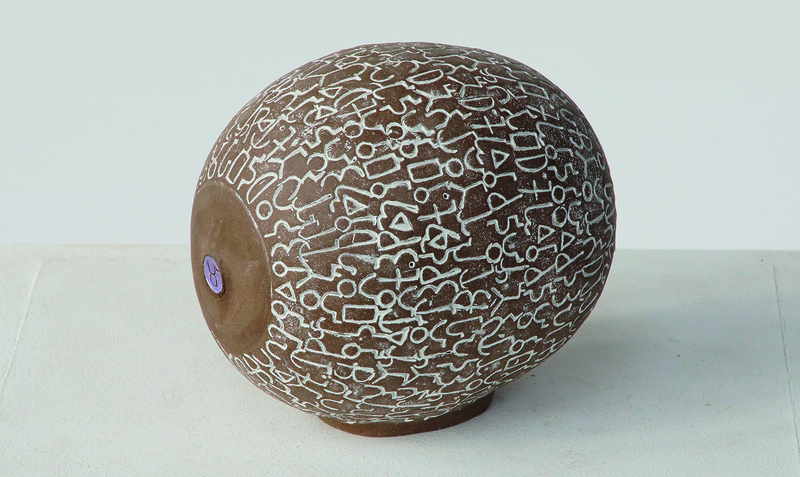 In between that time I also made earthenware work and participated in numerous exhibitions. Whilst there I had a yearning in me that wanted more so I applied for a scholarship of which I received, which gave me an opportunity to further my studies at the university of arts London (Central Saint Martins) 2011-2012. Thereafter I relocated to Germany, where then I founded Andile-Ceramics. 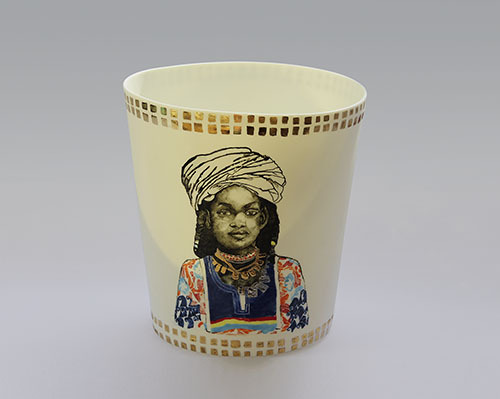 Andile-Ceramics makes handmade porcelain, ranging from functional ware and jewellery to conceptual work. As stated before, my earlier works were mostly earthenware but I have then since moved on to a more challenging and daring body. When I view another artist’s work, I am immediately pulled in or repelled, and it is colour and texture that creates this flirtation with a piece. Colour command my attention and texture evoke a desire to experience the art on a tactile and emotional level. Once my senses are aroused, it is emotion that begs to be noticed. The work of Marilyn Richeda seduces me on both these sensual and emotional levels. Her work, represented here, invites me on a journey into a world where the artist’s expression joins forces with my rampant imagination to create quite a moving experience. Richeda’s colour choices in muted tones first bring a hush so that visually, I am captured and emotionally, I am listening. Then I notice the textures, which lend to the mysterious quality of the work. Are those scratches and scars to the clay the work of the artist’s hands or the work of time having worn away at the memories the sculptures contain? I am captivated. 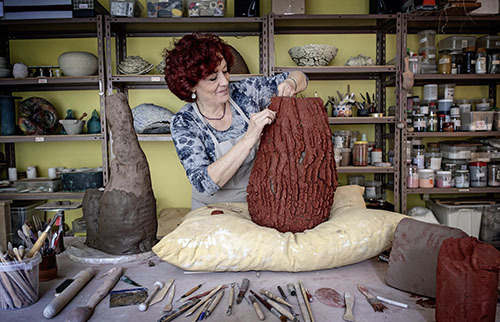 Richeda hand builds with terracotta clay using coils and slabs. At the point of intersection between design, fine art and craft, making ceramic art is not only difficult to categorize but it also provides an emphatic counterpoint to our digital and frequently dematerialised lifestyle. But it captivates us by one thing above all – its huge joy in experimentation, thus paying due homage to our theme, “Fantasy Island”. 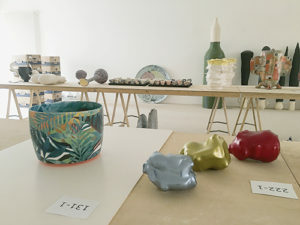 It thus seemed obvious for swissceramics, the Swiss ceramics association, and the Kunst(Zeug)Haus (“art armoury”) in Rapperswil-Jona to cooperate in organising the juried group exhibition Fantasy Island. 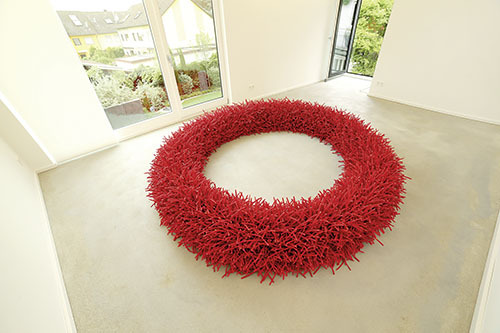 The Kunst(Zeug)Haus as a centre of contemporary Swiss art is particularly concerned to promote pluralist approaches in art practice and to provide a platform for various artistic genres. 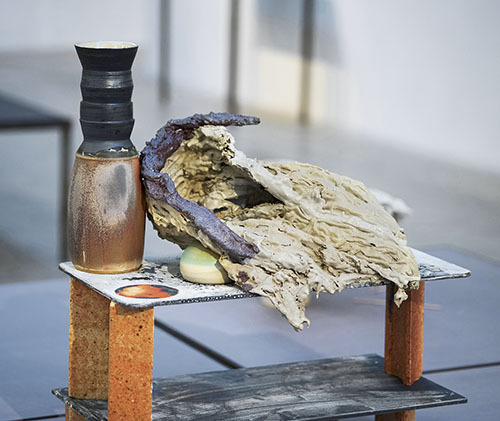 The fact that the participants of the swissceramics exhibition are from the various geographical and linguistic regions in Switzerland also corresponds to the pan-Swiss, trans-regional orientation of the Kunst(Zeug)Haus. As always, COLLECT 2019 in London showed itself in a fascinating ambience. Bright, spacious rooms at the Saatchi Gallery – stocked with colourful exhibits in all shapes and sizes – invite visitors in. 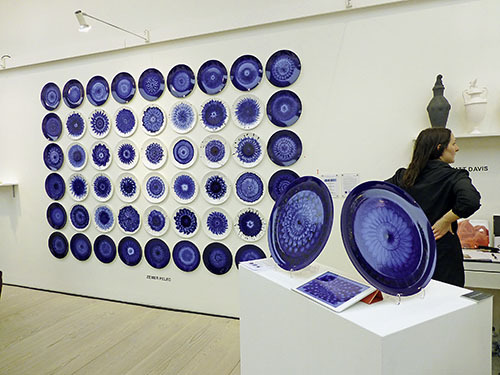 In niches, on walls, on plinths and tables, in display cabinets, the work of around 400 artists from 30 countries is flawlessly and excitingly showcased on three floors. To gain anything like an overview certainly takes time, with so many beautiful, new, classic or interesting things that induce you to linger. My own way of getting a first impression is thus always an impartial stroll around, absorbing the abundance. Intentionally permitting this leisurely approach feeds the unconscious; a more precise observation and taking in of details, selecting from the diversity, clarifies itself to me on the second or third run through, with an eye to the most interesting centres of interest frequented by experts, and looking for what is special, different or typical for this iteration of Collect in 2019. In this way a generally valid impression can be formed, along side my own personal one. Our minibus came to a halt after a drive winding through a mountainous region with lush vegetation of bananas, bamboo and tea bushes. We had arrived at the largest tolou in Fujian province, an impressively monumental construction made of rammed earth. 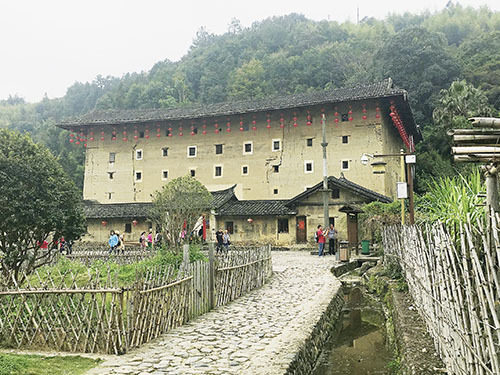 In 2008, approximately 23,000 earth houses still in existence in the provinces of Fujian, Guangdong and Jiangxi in the south and southeast of the country were listed by UNESCO as world heritage sites. The earth houses were built between the 12th and 20th centuries by the Hakka. The Hakka people originated in northern China and are one of the eight ethnic groups in China. After the Song dynasty was displaced by the Mongols in the 13th century, they fled across the Yellow River and the Yangtze to the mountainous south, where they could continue to live with their language and according to their culture. The name Hakka means “guests”. Wang was born in Taichung, Taiwan in 1971. 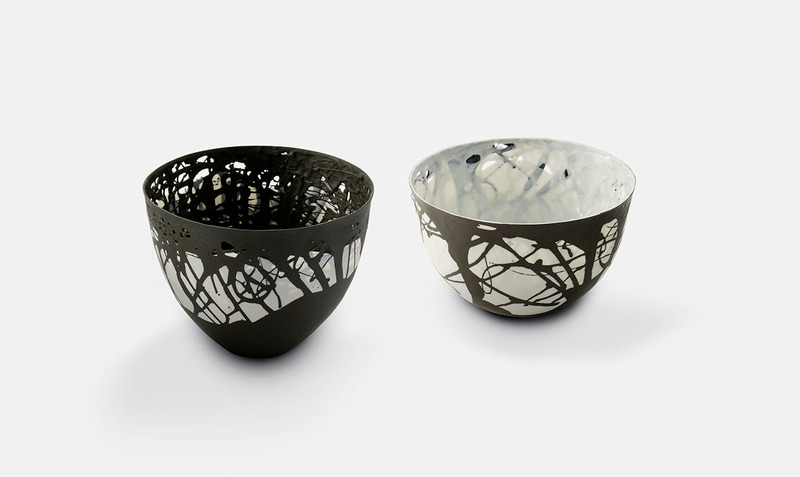 His thin porcelain is a synthesis of the traditional concept and techniques of thin porcelain and contemporary, new experiments on thin porcelain. The elaborate and elegant White Thin Porcelain and Circling Clouds, or the dynamics of the Colorful Patterns series, demonstrate the highly focused and sophisticated craftsmanship. The delicate lightness and colours of his works manifest the tranquillity of time or an animated aesthetic charm. Bean Finneran was born in 1947 in Cleveland, Ohio. The artist brings many ceramic tubes of various shades into different fields. 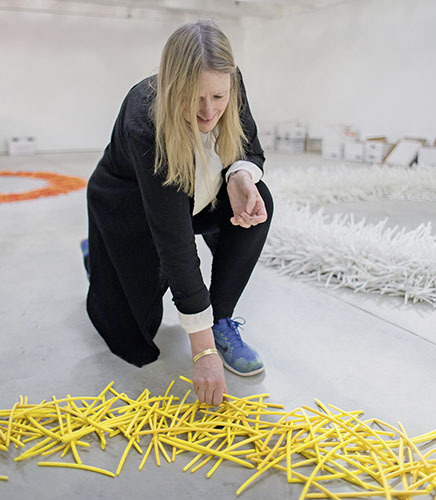 As the tubes are installed, their colours and shapes begin to interact with the space until the work is fully installed and has quietly expanded in space, urging the viewers to re-examine the actuality of the new space. Heide lives in an area which 140 million years ago, in the Jurassic period, was under the sea. A cornucopia for geologists. But not only for them! 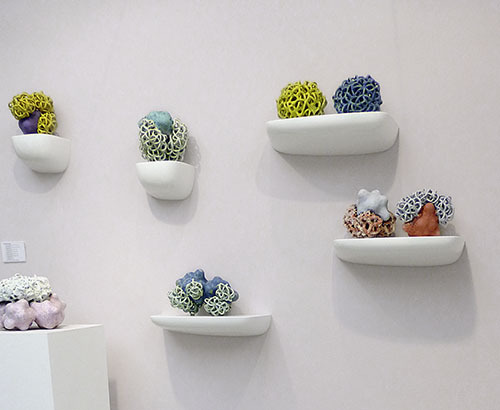 Experimental ceramists like Heide find inspiration for their work there, as we can see in the following interview. Heide, you are a ceramist body and soul. 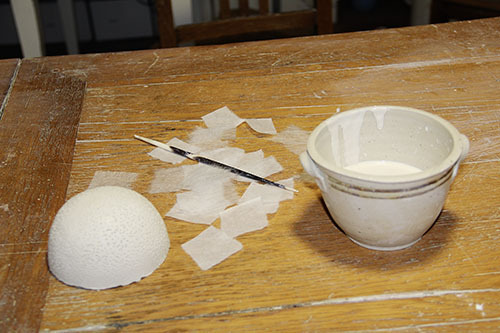 When you chose your profession, what made you decide on clay and porcelain? 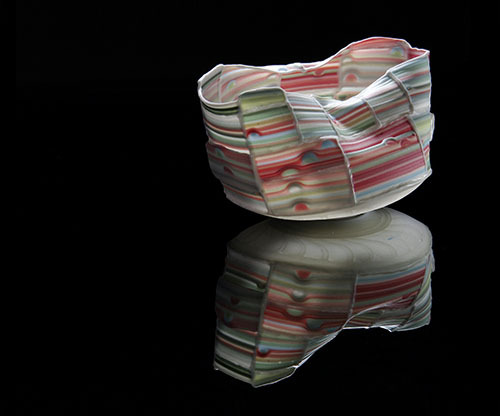 With clay and with porcelain I am fascinated by the various physical states of the material. Ceramics is a material that you can find all over the world. The firing process is an important aspect, which follows its own rules. I hit upon porcelain when I was invited to the international symposium in Kahla. 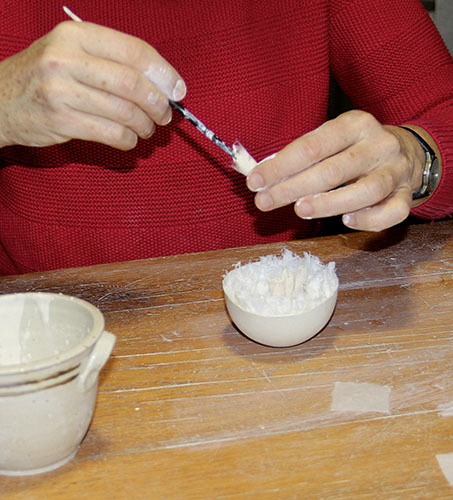 The porcelain factory offered us artists a huge area to experiment in. Gift subscription, trial subscription, regular subscription, online edition. 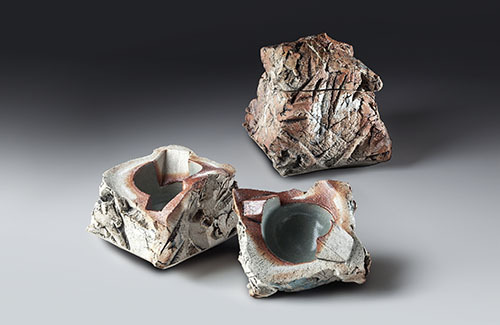 With these subscriptions, you can regularly bring the whole world of art ceramics into your home. Wherever you have internet access, you can read New Ceramics – at home or on your travels. Price: 36€ including permanent access to our archive. Regular Subscription – 6 issues a year for 53€/US$65 by World Surface Mail, 66€/82US$ by World Air Mail. The subscription is renewed automatically for a further year at the end each year. Student Edition (verification required) is 39€/US$48 by World Surface Mail. The subscription is renewed automatically for a further year at the end each year. Trial Subscription – 3 issues for 26€/US$33 by World Surface Mail, 33€/41US$ by World Air Mail. The subscription ends automatically after 3 issues. 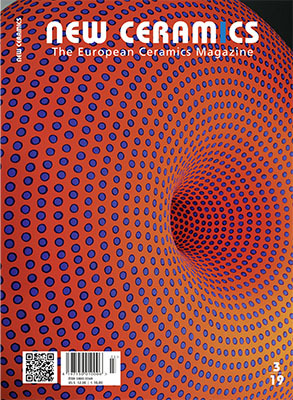 Online Subscription – PDF edition, €36 a year with permanent access to our online archive. The subscription is renewed automatically for a further year at the end of each year. Gift Subscription – 6 issues for the recipient. The invoice for 53€ /US$ 65 by world surface mail, 66€/US$82 by World Air Mail will be sent to you. We dispatch the magazines on your behalf. The subscription ends automatically after one year.